In the most basic of terms, VA Second-Tier Entitlement gives a qualified military person the ability to buy a home after a default or they can possibly have two VA loans at the same time. This may seem contrary to popular opinions on qualifying for a VA mortgage, but that is due to the lack of knowledge on VA Second-Tier Entitlement. The service requirements for a Second-tier Entitlement on VA loans are the same as a normal VA loans. People that are in the reserves, full time active duty or a qualifying spouse of a veteran may all apply for the loan. Beyond this, the lender will consider several criteria. First of all, the applicant must be current on their home loan payments on their existing VA mortgage. The lender will look closely at the applicant’s credit report to make sure the last 12 months’ payments have also been made on time. How to qualify for two VA mortgages at one time. VA Second-Tier Entitlement! Additionally, there needs to be a clear reason why the family is looking to buy another property. Namely, a Permanent Change of Station (PCS) or change in their family such as the arrival of another child or taking on the care of an elderly relative. Another example could be a family that has received orders to move to a different duty station. To state it clearly, a second-tier VA mortgage is not an invitation to veterans to intentionally buy a home as a rental property. The applicant’s debt to income ratio will be scrutinized to make sure the veteran can make all of their existing payments along with the 2 house payments. The applicant will also need to meet the requirements of residual income for their family size and their area. 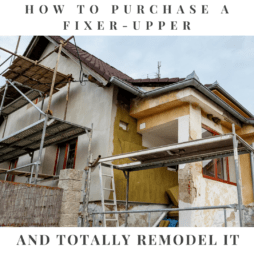 If the applicant plans to rent out the first home in order to cover the costs, there will need to be a formal lease with clear terms and amounts. This lease agreement can help the applicant meet the debt to income guidelines. For these reasons it is highly advised that the applicant work with a lender that is experienced with second-tier VA mortgages. All across the country eligible VA mortgage borrowers are told that they have a primary entitlement that amounts to $36,000. They also can get a secondary entitlement for $68,250. The combined amounts of the entitlement equals $104,250. 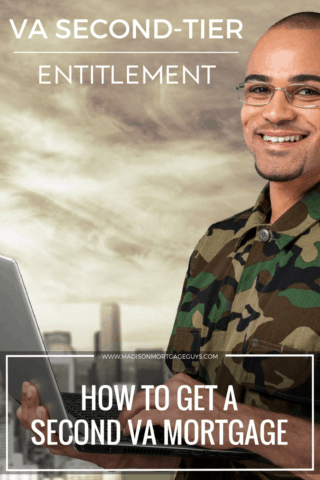 If the veteran is applying for a mortgage in a high priced area it is possible to get a slightly higher entitlement. When a person is approved for a VA mortgage, the Veterans Administration guarantees ¼ of the total loan amount. For example, if a person receives a loan in the amount of $225,000 that would mean the VA is guaranteeing $56,250. Now, subtract the $56,250 from the $104,250 amount and you are left with $48,000. This would mean that the qualifying veteran could possibly get another mortgage up to $192,000 (4 x $48,000). There is no set maximum amount. As long as the applicant can meet the debt to income guidelines as well as the residual income guidelines, they can get a loan as big as they wish. There is another reason why a qualifying VA applicant could use the VA Second-Tier Entitlement. Going through a tough economic situation can force some people to make unpleasant decisions. These decisions can result in negative positions such as bankruptcy or foreclosure. The recent recession saw a lot of families realizing that their home was worth much less than they originally thought. 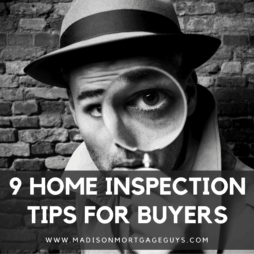 This caused a number of home owners to sell their properties for less than the balance owed on the mortgage, causing them in to a short sale transaction. With bankruptcy, foreclosure and short sales it is important to keep in mind that many lenders require a waiting period before a person can apply for another mortgage. However, for someone that previously used their VA entitlement there is another thing to consider. If a home is foreclosed, or the home is disposed through a short sale, part of the veteran’s eligibility will be used up. This means that the veteran and their lender will need to determine how much eligibility is remaining. Suppose a veteran originally qualified for a $190,000 home loan and the loan was foreclosed. Using the VA calculation that 25% of the home loan is guaranteed, $190,000 x 25% = $47,500. Thus, $47,500 of eligibility was used up in the first mortgage. Since we previously determined that veterans have a total entitlement of $104,250 that would mean that $104,250 – $47,500 = $56,750. The veteran still has $56,750 of entitlement available. One of the attractive features of a VA mortgage is the fact that a down payment is not required. However, this does not mean that the qualifying veteran is not allowed to make a down payment. And in the case of a Second-Tier Entitlement on VA mortgages, it may be necessary to make a down payment in order to get the right house. How to get a second VA mortgage. 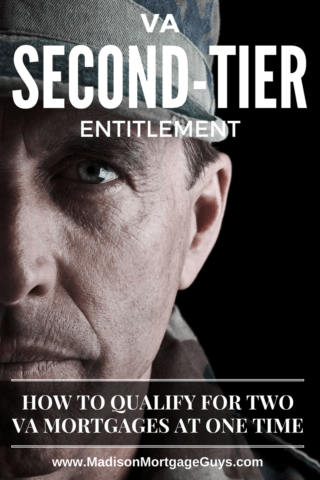 VA Second-Tier Entitlement explained! For example, let’s look at the following hypothetical scenario. A veteran and his family purchased a home with a beginning loan balance of $250,000. The home was later sold in a short sale situation. $250,000 x 25% = $62,500 amount of entitlement used for first home. $104,250 – $62,500 = $41,750 amount of remaining entitlement left for the veteran. $41,750 x 4 = $167,000 maximum amount of 2nd tier VA mortgage that the veteran can get with zero down payment. In this example, if the veteran chose to buy a home valued at $195,000 then the veteran would be asked to pay the difference between the $48,750 ($195,000 X 25% = $80,000) and $41,750 (remaing entitlment left which was calculated above), or $7,000. Besides being asked to pay the difference, all the other benefits of a VA mortgage would apply. 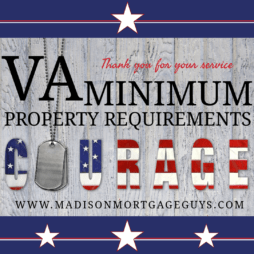 No mortgage insurance, attractive interest rates, fixed terms, less stringent credit requirements and the ability to pay the loan off early without penalty would still be available to the veteran as long as they are approved for the home loan. Most of the article above explains the maximum amount of mortgage that a veteran can get based on various circumstances. However, there is another point to keep in mind for second-tier VA mortgages. The beginning loan amount must meet the VA minimum of $144,000. This minimum was enacted many years ago. The idea was to ensure that qualifying veterans were not being forced to choose cheap homes in questionable areas that could later turn out to be a detriment. Basically, the qualifying veteran must get a home of at least $144,000, otherwise the VA will not ensure the home at all. Although VA Second-Tier Entitlement do not get the attention and advertising like traditional VA loans, they are important to veterans. Considering the fact that military families are often asked to move to a new base, or with the growing number of families taking on the care of their elderly grandparents and parents, it is not uncommon to see a family suddenly in need of a different home. 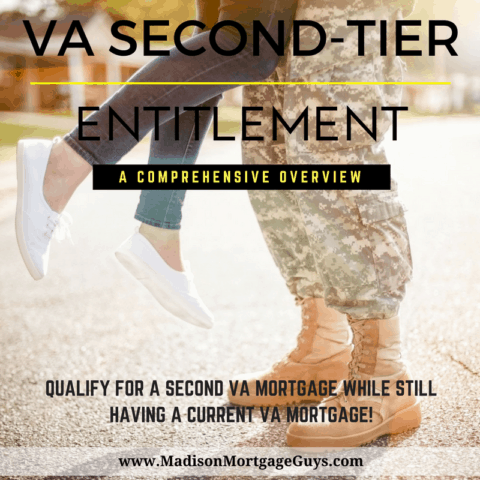 With a seasoned lender at your side it is possible that you can make your way through the qualification process and find that you are eligible for a Second-Tier Entitlement on a VA mortgage.